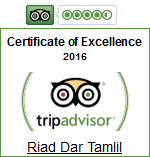 Comfortable and affordable hospitality! Riad Dar Tamlil is a great place to stay in Marrakesh for a lot of reasons. First of all, its location is just steps away from Place Jemaa El Fna, so stopping by to drop off shopping or change shoes is really easy. Second, it is very clean, beautifully decorated and furnished, the included breakfast is delicious. And third, which may be very important for a lot of travellers, it is very affordable. Considering its location and service, I would say it is very very cheap! Unless the management changes, I wouldn't hesitate to book it any time.